26 with Tingling, Numbness, with pain and cramps after treatment. Ok, so there is a lot of explaining to do here and I'll try my best to describe what I'm experiencing. I'm a 26 year old female (weighing 118 lbs.) and I was having lower back pain, as well as pain in my right wrist that radiated up to my elbow, so I went to a chiropractor. I'd never been before but went to one that a good friend recommended. I saw the X-ray and there was indeed a curve in my chest area and a smaller one below, which he called a compensatory curve. He recommended a long term treatment plan with me coming 3 times per week for 4 weeks, tapering off to 2 times for 3 weeks, and so on. I don't have insurance so I knew I couldn't pay for that many visits. I told him that I would think about it. The night after my adjustment, I had a horrible sore throat and chills. I have no idea whether this was related or not. The next day, the sore throat had backed off quite a bit and I actually felt relatively normal. A day after that I had strange sensations in my arms. It felt like rushes of cold air going through them. Then after those sensations went away, I was left with my arms/hands having a (slight) numb feeling. I could still feel touch and heat/cold, it was just strange. I also had normal arm/hand strength. When I went back to the chiro a few days later, I told him about the sensations and he said it made sense because of the subluxations in my cervical spine/upper back. He adjusted me one more time and I left feeling like he had just brushed me off. I should also mention that my hands were falling asleep at night, however, I sleep with my head on my arm so I'm not sure if I just noticed it because I was hyper aware of my body at the time, plus it would go away after relieving the pressure. Shortly after this, I noticed my feet felt sort of numb first thing in the morning. It would mostly go away after walking around though there was still some slight numbness (especially in my big toes.) I would also get pain in the sole and heel of both of my feet. Nothing unbearable, but it is uncomfortable. Almost cramp-like and especially in my left foot. Within the last week, I've been having heat sensations in my right leg. This occurred after I had tenderness in my back right thigh area (sciatica?) They're fleeting, but it happens at least 10 times per day. Also, I've had an itchy, tingling feeling in my left shoulder blade, maybe 5 times per day. Is it possible that all of these sensations are related to me getting adjusted? I know that bodies can go through a "healing crisis", especially if they've been out of whack for a long time. I did seek the opinion of another chiropractor and she has adjusted me twice. 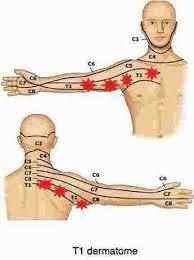 The numb feeling in my left arm went away less than 24 hours after she adjusted me, focusing on that area. She said that my hips were slightly rotated (the first chiro had told me that as well) and my left leg was drawn up by a 1/4 of an inch. She did not seem concerned about my presenting symptoms either. She said that the vertebra in my neck were "off some" and she did some adjusting to the neck region. Basically, I'm just completely freaked out thinking that I have some neurological disease. I haven't had any changes in my vision, balance or anything like that. I was concerned about MS but read that symptoms primarily present on one side of the body at a time (especially at first), depending on where the lesion is. My symptoms have been on both sides for roughly 3 weeks. If nothing changes in a week or so, I will consider forking out the money for an MRI, because my anxiety just can't take it anymore. Any input or advice would be much appreciated! Thank you in advance. There are lots of issues that you raise here and I can only comment in very broad general terms. 1. Number of treatments. There's no unanimity in the chiropractic profession about how much treatment is too much treatment, probably because it varies so much with age, injuries, arthritis, etc. Having said that, it's strictly my opinion that 18 treatments in the first 7 weeks, is over treatment. Obviously the greed factor creeps into our profession too. 2. You had no leg pain as I understand it prior to the chiropractic treatment. That is a legitimate concern. Having said that, some after pain is not uncommon, but nevertheless I would certainly want to reevaluate my treatment if a patient developed radiating pain after the treatment. The spine is unstable after treatment, and sometimes these developments occur because you weren't warned to be gentle with your self after treatment. To go home and vacuum the house for example would be asking for trouble. 3. You make no mention that leg length was considered. A scoliosis is often caused by an "anatomical" short leg. That's different to the shortened leg caused by the "hips being rotated" though I wouldn't have used that term. A simple inexpensive lift in the shoe can make a huge difference. 4. As far as I can tell there was no emphasis on daily exercises; vital for anyone with a scoliosis in my book. 5. Sleeping on your tum with your head turned to the side, on your arm, is a recipe for a very sore neck and radiating pains down the arm. I could go on. It's my job here to be the devil's advocate. Both chiros you saw would probably be incensed. But I do feel you have problems that fit very much into the conditions I treat on a daily basis. You need to find someone with whom you "click", and that's hard. Take your time now before going to a third chiropractor. Collect your x-rays if you're not going back to the first. Don't submit to any more at present, more ionising radiation wouldn't be good in the immediate future. I doubt an MRI is necessary. You don't have MS. I hope this contributes; probably raises more questions that answers your doubts, I suspect.